Accounting or Accountancy is the art of measuring, communicating and interpreting financial activity. Broadly, accounting is known as the "language of business". Accounting referred to as the language of business because it is a means to deliver financial information to those who need them. Interest Accounting is to prepare an accurate financial statements that can be used by managers, policy makers, and other interested parties, such as shareholders, creditors, or owners. While the Financial Accounting is a branch of accounting in which the financial information in a business is recorded, classified, summarized, interpreted, and communicated. However, What is the term for one who works in Accounting? Surely you already know, of course. A practitioner Accounting disebu as an Accountant. After reading the explanations What is Accounting, and What are the duties and responsibilities of a Accounting (accountant) above, may be able to shed some light for you in your work selecting our future. It's up to you want to work as accountants or accounting staff. 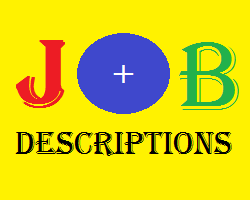 Belum ada Komentar untuk "Jobs Description An Accounting"